Meanwhile, Hyderabad’s average traffic speed plummeted from an Indian-best 27.1 kmph to 18.5 kmph. 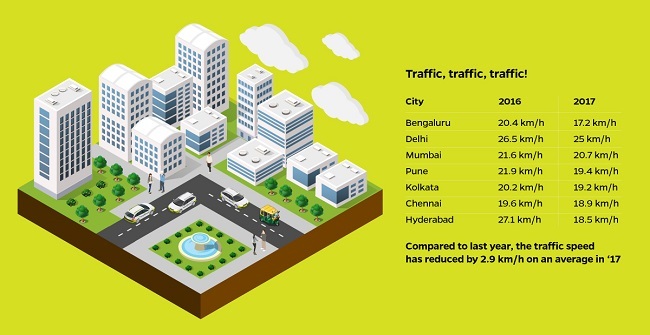 A year-end study by taxi aggregator Ola, has, unsurprisingly, found that Bengaluru has the slowest pace of traffic among the major Indian cities. 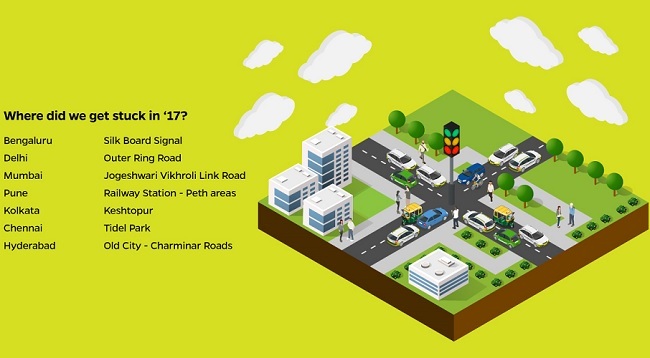 The average traffic speed in Bengaluru was clocked at 17.2 kmph, which was the slowest among seven cities studied. Hyderabad (18.5 kmph) and Chennai (18.9 kmph) completed a top three of south Indian cities for slowest traffic speeds in India. Delhi meanwhile had the highest traffic speeds in India at 25 kmph. Total traffic speeds in India dropped by 2.9 kmph compared to last year. While Bengaluru’s traffic speeds dropped from 20.4 kmph to 17.2 kmph compared to 2016, Hyderabad’s average traffic speed plummeted from an Indian-best 27.1 kmph to 18.5 kmph. Silk Board Junction was (obviously) found to be the busiest junction in the city. Cabs got holed up in traffic jams at this junction more than anywhere else, according to the study, with the junction being compared to Outer Ring Road in Delhi, Jogeshwari-Vikhroli link road in Mumbai, Koshtepur in Kolkata, Charminar Road in Hyderabad and Tidel Park in Chennai. In Bengaluru, other busy points included Electronic City, Indiranagar and Cox Town. The study also showed that Bengalureans tried to beat the traffic by leaving 25 minutes later to work than in 2016. While traffic peaked at 9.20 am in 2016, the study claims that office-goers left at 9.45 am in 2017. The study also revealed that office-goers left earliest in Mumbai at 9.12 am, while people in Hyderabad left for office at 9.52 am.